Stewart Butler refused to go home. The day World Options, the shipping services franchise, launched, he told his co-founder Andrew Jackson they weren’t allowed to leave work before making their first sale. “I couldn’t afford to fail,” Butler says. “It wasn’t an option. And when your back is up against the wall you can do two things – you can either handle it or you can run from it.” He opted for the former and kept pushing because, after all, what choice did he have? Not only had he bet all his worldly possessions – including remortgaging the house he lived in with his young family – on the seemingly far-fetched notion SMEs deserved the same level of carrier service as huge conglomerates, but he’d also roped his partner and both of their wives into the project. “It was quite scary,” he admits. From the outside, the embrace may seem like an entrepreneur celebrating the first of many successes that would turn the company into a global brand with hundreds of franchisees around the world. However, that would miss the significance of the moment. For Butler it soothed a fear of failure he’s carried with him ever since childhood. “I remember being five years of age and playing outside in the back garden,” he recalls. “I was messing around, throwing stones, and my mum called me [into] the kitchen and she looked me in the face and [gave me] a backhand around the ear. And I remember her saying ‘Stewart, you know what, you’re a waste of space. You should’ve never been born and when you grow up you won’t amount to anything in your life.’” That moment has motivated him to prove her wrong in the years since. “You can either sit down and moan about it or you can do something about the things you can change [and] don’t worry about the things you can’t,” Butler shrugs. His drive saw him work hard to get the best results he could in school. While admitting this didn’t always yield straight As, his experience with education taught him a vital lesson for his future entrepreneurial endeavours – time management. And even when he left college to get a full-time job, Butler kept pushing himself harder and harder. “I took an economics and marketing degree at night school for four years [on top of] working six days a week,” he says. Having first tried his hand at car salesmanship, he eventually found himself working with a shipping company – leading him towards his future franchisor role. “This was probably in 1999 or in the early 2000s,” Butler remembers. “The internet had started but in the shipping industry it was a bit archaic, it was still way behind industries like banking and insurance.” This lack of innovation in the sector eventually presented him with the key insight required to launch his own enterprise. “The idea behind World Options was to be able to give small to medium-sized businesses [the same] treatment as large companies,” he explains. So why didn’t SMEs get the same red carpet service larger firms did? “It’s the economy of scale,” answers Butler. Essentially, it boiled down to one simple fact – it would cost large carriers and shipping companies too much to give each and every small-business leader the same attention that larger companies got. Therefore they’d rather opt to focus on clients shipping large quantities than small ones. “So I thought, ‘hold on a minute Stewart, there’s a hole in the marketplace here,’” he remembers. The thought didn’t leave him alone. And as Butler pondered over it, he realised how a shipping service for SMEs could make a lot of money. “I went home that night and I said to my wife, ‘I’ve got an idea’ and she was like ‘okay, tell me,’” Butler recalls. Over the next few hours he explained his brainwave by drawing it on a white board and answering all of her questions. Eventually, his wife gave her thumbs up to launch the business. “I remember [how] she said ‘right Stewart, it’s three o’clock in the morning, you’ve got my blessing, I’m going to bed’ and that was all I needed,” he says. With his wife on board, Butler leaped into action. The first item on his to-do list was to secure funding for the enterprise. But despite bringing charts, cashflow projections, SWOT analysis and everything else needed in a solid business plan, the bank required some more convincing. While Butler recognised the reluctance to lend to an untested venture, he asked the bank manager to have some faith. “And he answered ‘I cant give you the money based on faith,’” Butler remembers. Refusing to abandon his idea, the budding entrepreneur pressed on and eventually managed to persuade the financial institution that his endeavour was worth betting on. Armed with the bank loan and having remortgaged his home, Butler had almost everything he needed to launch World Options. The last piece of the puzzle snapped into place when he found his co-founder. “Andrew has always been a good friend of mine,” says Butler. “I’ve known him for a number of years.” Not only was Jackson highly skilled at the operational side of doing business but their wives were also very close friends. So when Jackson heard that Butler was setting up a company of his own, he wanted to be part of it. “He’s a really good guy,” says Butler. Together, the two of them, their wives and an administrator became World Options' initial workforce. As the years went by, the founders contemplated new ways of growing the business. And that’s how they began floating the idea of franchising World Options. 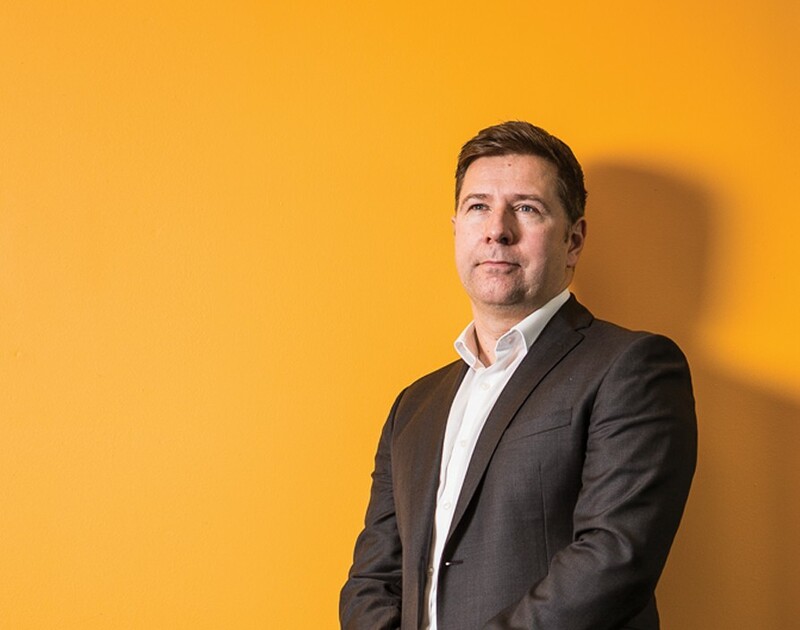 “We knew we had something that was very different, unique and unusual but we needed the footfall of a franchise network to create critical mass,” Butler explains. Franchising the company made sense for a number of reasons. Firstly, it would boost the business’ talent retention. Most salespeople at the company only stayed for a few years. So franchising would give experienced salespeople reasons to stay on as franchisees, minimising the time wasted on training new staff. Moreover, establishing franchisees who understood the local area and the trials and tribulations of its SMEs would enable World Options to nurture strong and long-lasting relationships better than before. “The franchise network is almost like having a mum and pop store, allowing us to give that special one-to-one treatment to customers,” Butler says. Given these advantages, opting to transform World Options into a franchise was a no-brainer. Clearly not one to rest on his laurels, Butler charged forward in 2011 by launching a pilot franchise. “We knew it would work but wanted to prove it to ourselves and to the bfa,” he remembers. Recognising the importance of getting the model right from the get-go, the aspiring franchisor based it on a combination of the pilot franchisee’s experience and advice from insightful franchise lawyers. After one year, World Options presented their ideas to the association. “The bfa looked at it and said ‘Great idea,’” he states. The intimate relationship between the franchisor and its franchisees also resulted in the business boosting its innovative power. Having already spearheaded the development of World Options’ online portal that automised many SMEs’ shipping needs, Butler was no stranger to evolving the business model. But with franchisees on board, he suddenly had access to even more brainpower from more interactions with customers. “So these are fresh ideas in the marketplace,” he says. And to ensure no new ways to boost the company’s performance slip through the cracks, the franchisor takes time to listen and test every new concept. “There are some ideas that come through where we think ‘Really?’” Butler admits, “But you know what, we don’t discourage them.” This has meant that on every franchisee meet-up, the franchisor can list hundreds of small solutions that have made World Options better thanks to franchisees’ ideas. Having secured critical mass in the network and heightened the model's standards, it was only a question of time before World Options would go global. “About three years ago we got invited to the US by one of the carriers,” Butler recalls. “They said ‘Guys we know you’ve been a great success in the UK and we’d like to model this in the US.’” The initial push into North America followed essentially the same format as the UK rollout. The franchisor began by running a pilot franchise for 12 months. At the same time it made sure to transform the technology that runs in the background and to tweak the franchise agreement to follow the country’s regulations. Once confident it could work, World Options unveiled the model to the public and the response was wilder than anything he’d experienced in the UK. “Franchising in the US is a completely different animal,” Butler says. “Americans’ adoption of franchising is like second nature to them. It’s not even in the realm of how we do it.” This attitude meant the US network has grown to seven franchisees already, with another 20 people being expected to join the network by the end of 2019. Following the success in the US, more markets have followed. “We’re live in Belgium, we’re live in the Netherlands, we’re live in Australia and we’re live [along the] Singapore coastline,” Butler says. And the franchisor isn’t stopping there. In fact, there are plenty more plans on the horizon and the company has already agreed partnerships with several carriers around the world for how the rollout will work. “We're probably going to franchise in 22 countries globally,” he explains. However, having signed a non-disclosure agreement, he can’t provide any more details than that but urges readers to watch this space.